Quantile Regression: Is the Whole Greater than the Sum of the Parts? The forecast says predictive analytics. As its wide-scale use rapidly grows, this prognostic technology affects everyone every day. It touches your moment-to-moment life as a consumer, patient, employee, and Internet user. From a higher vantage point, it overhauls business and government by more adeptly driving the major operations of commerce, manufacturing, healthcare, and law enforcement. Predictive analytics also takes center stage in this year’s most pressing matters: national elections and national security. It changes the game as presidential candidates use it to win more votes. And it intensifies the debate on NSA data collection since this tool helps discover terrorism suspects, yet depends on bulk data to work. First, let’s define it. 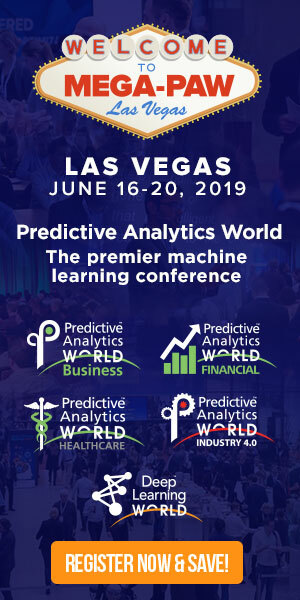 Predictive analytics is applied science that learns from data to generate many predictions, e.g., whether each individual person will click, buy, like, default on payments, or become ill. These predictions boost the odds across millions of organizational decisions simply because the predictions themselves are considerably better than guessing. Predictive analytics is the Information Age’s latest evolutionary step. This singular, universally applicable force can improve every large-scale thing we do—how we build things, sell things, and prevent bad things from happening—because every function benefits from prediction. As its deployment takes hold across industries, we have moved beyond engineering the infrastructure that manages big data to implementing the science that taps its contents for more intelligent decision-making. Predictive targeting is the antidote to information overload, and consumers are realizing they rely on it. This is how Google serves relevant search results, Facebook orders your endless news feed, email critically filters spam out of your inbox, retailers send less junk mail, and today’s hot promulgator of online media Mashable pinpoints what will go viral. Overwhelmed by an explosion of options, consumers—at times, unknowingly—turn to prediction in order to navigate the choice of movie (Netflix), music (Spotify), book (Amazon), flight (Hopper), accommodation (Airbnb), price at which to rent out your own home (also Airbnb), romantic date (Match.com), person to tag in a photo (Facebook), ad that interests you (also Facebook), people to “friend” (Facebook and LinkedIn), least-congested driving route (Waze and IBM), and optimal shipping routes (for UPS drivers). If you drive for Uber, the company is working to predict which neighborhoods will have the highest demand and which destination each passenger will request. Precautions are targeted, too: Predict bad things in advance and you can prevent them from happening. User-friendly self-diagnostic tools predict when you will die and foretell fates worse than death: divorce, cyber attacks on your business, failed medical procedures, and erectile dysfunction. Eric Siegel, Ph.D. is the founder of the Predictive Analytics World conference series—which includes events for business, government, healthcare, workforce, manufacturing, and financial services—the author of Predictive Analytics: The Power to Predict Who Will Click, Buy, Lie, or Die—Revised and Updated Edition (Wiley, January 2016), executive editor of The Predictive Analytics Times, and a former computer science professor at Columbia University. For more information about predictive analytics, see the Predictive Analytics Guide.